Indoor Saturdays at the YMCA are done for the season. We'll be back in October or November. If you want to find us, you can find us at Father Marinaro Skatepark on Wednesdays- www.fmskatepark.com. We'll arrive 6 or 6:30 or so and ride until the park closes sometime after 8pm. We probably won't have much in the way of loaners, so bring your own. We will be sharing the space with other park users, so beginners aren't our priority (this time of year). That's not the only place to find us, but that will be our consistent meeting place and time. The trails around are another place to look for us on Munis, and soon we'll be dominating the roadways on 36ers. We've been accused of being a posse by innocent bystanders. If you're new to the fold, asking Andy about unicycle tattoos is a good way to start. Right after that, have him show you how to hop onto a bench. To top it all off, ask him how long he's been riding. By the way, his brother Tony is just as amazing. Item #2: Today is the last indoor day at the YMCA. We'll still be riding; we just won't be accomodating those who need to borrow unicycles as much. If you still haven't tried and your interest is piqued, we'll be back for gym time again in October or November. If you have your own unicycle and you'd like to ride with us, give us a shout. Well, an email or phone call would actually be a bit more effective. Saturday the 24th will be the last indoor session at the YMCA. We'll be outside after that. We won't probably have much in the way of loaner unis when we meet outdoors. We will be meeting, probably even on a regular basis. We just won't be indoors. Keep checking back. 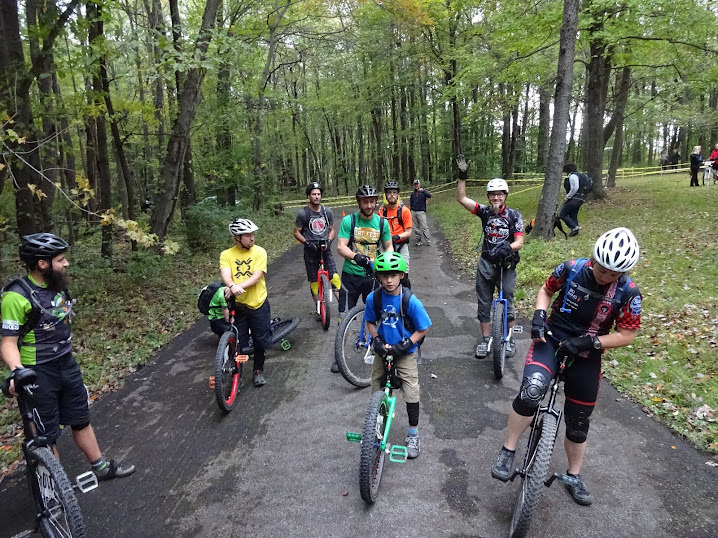 Anyone checking here for the low down on the upcoming Butler County Stage Race - unicycle division? If so, here's the scoop: The Butler Wobble will be a sponsor and you'll need to be a Unicycling Society of America member to ride. The reason is twofold: 1. We need liability insurance. We're covered if EVERYONE who is riding is a USA member. If we have to buy it privately, we'll have to charge you approximately $20- maybe more)for insurance for the 2 day event. If you join USA for $20 you get covered and a whole lot more benefits. 2. By joining USA you'll be part of the national organization. It shows the general public that there are more unicyclists out there than they think and they're not all going to be joining the circus. We'll be working out details for trying to register you close to the event.